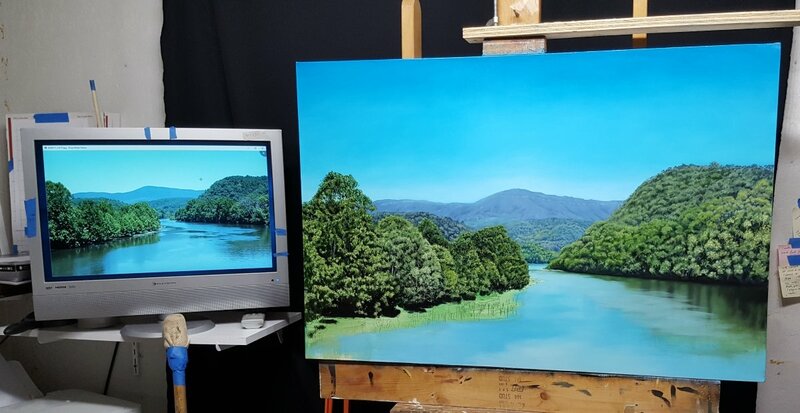 How to paint mountains, rivers in a landscape demonstration. This is a long demonstration! How to paint mountains can be a very complex subject, but you have some interesting tools on your side to tackle this big project. I'll explain as we proceed. Below is my reference photo facing north while standing on the Harry Byrd Memorial Bridge located on the Blue Ridge Parkway just north of the Rt.501 entrance. If you're ever near this location, I highly recommend a visit. Especially if you enjoy Plein Air painting. Several paintings will come from this one visit my son and I had while motorbike riding the parkway. Things I want to point out concerning the reference. Lots of folks would rather paint a sunset or sunrise, or at least a close proximity to those times as the shadows on the landscape will be long and moody. In this instance, the sun is almost directly overhead with a slight breeze on the water and causing lots of shimmers both on the water and the leaves of the trees. There is also a great reflection on both banks to give viewers that mirror reflection that is so pleasing. Harry Flood Byrd Memorial bridge overlook north, Blue Ridge Parkway, James River. 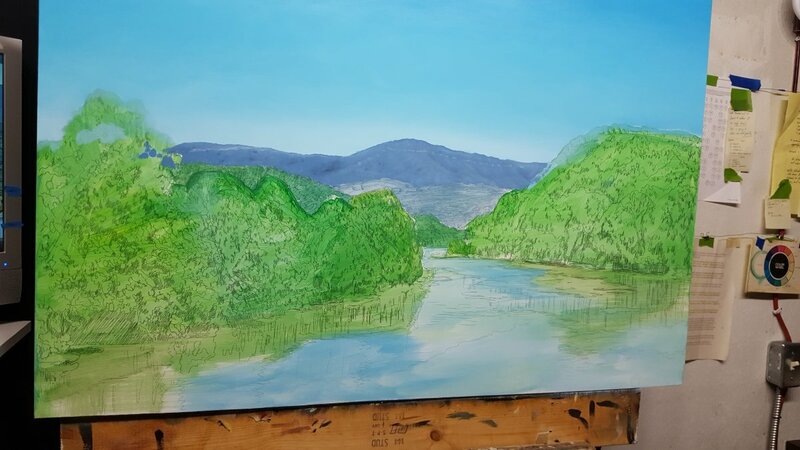 After cropping the reference a bit, and placing my river in the bottom third, the background mountains in the middle third and all sky for the top third, I transfered the drawing (fairly detailed) onto the canvas. Using an acrylic matt medium, (brushed on lightly as to not disturb the drawing), I sealed the pencil drawing. Then lightly sanding, I proceeded with an acrylic color underpainting. This was roughed in with a very large brush. That's about a #12 filbert brush you see there. How to paint mountains, but first we gotta start with the sky! By the time I have my one brush cleaned, and the tub washed, that acrylic layer is fully dried! I can now start on my sky. 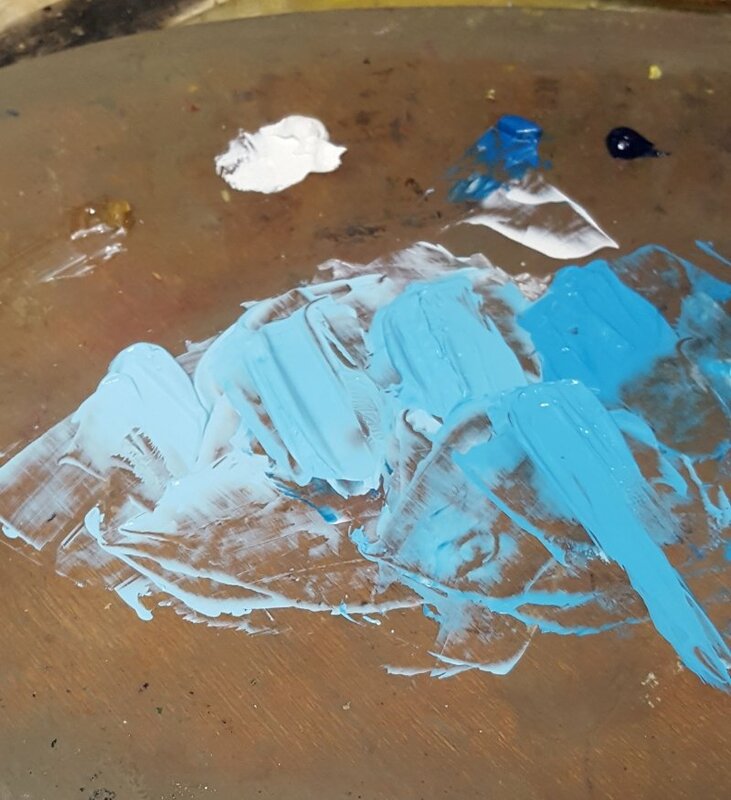 Again, Titanium white, and cerulean blue with a touch of Liquin Medium to help this dry overnight. Mixing 5 shades, darkest at the top and working my way down I lay in the color quickly and begin blending with a large fan brush then a large mop brush. Because this is a fairly large canvas, (24 x 36) I will need lots of paint. Please understand that should you purchase anything I will receive a small percentage of the sale as an affiliate of Blick products. I use em, I recommend them. Great customer service too should you have an issue. Click here to order this great tool! Now, some folks can get this kind of smooth transition with other mediums. Me? only with oil paints. 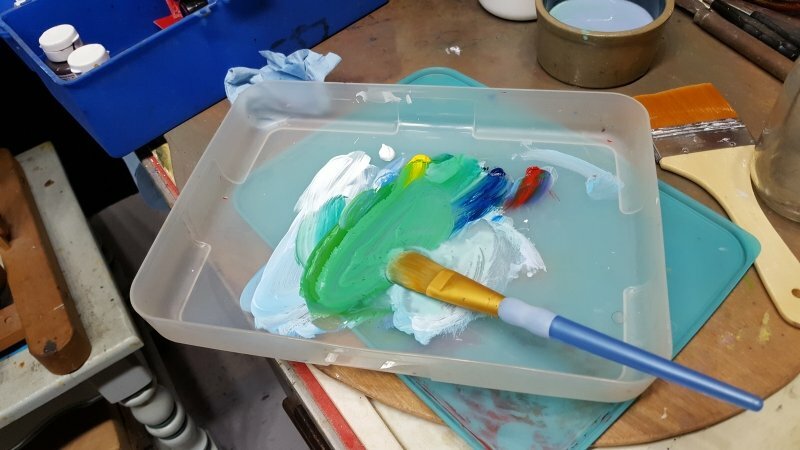 And over the next few days, I repeat this process 2 more times with thinner paint as glazes to even the transitions out so it is barely perceptible. I overlap the tops of the trees too as this will give a more natural look when the tree canopies are being put in. Below is a close up of the background mountain with its road running along just below the ridge line. This is just an initial lay in of color with a few details added. Normally details wait till a finishing layer, but here, as a background mountain range, I will not be adding much more to it. The mountain has features (crevices) that were laid in with a slightly darker purple. They follow the contour and form of the mountain. At this distance, individual trees cannot be seen. 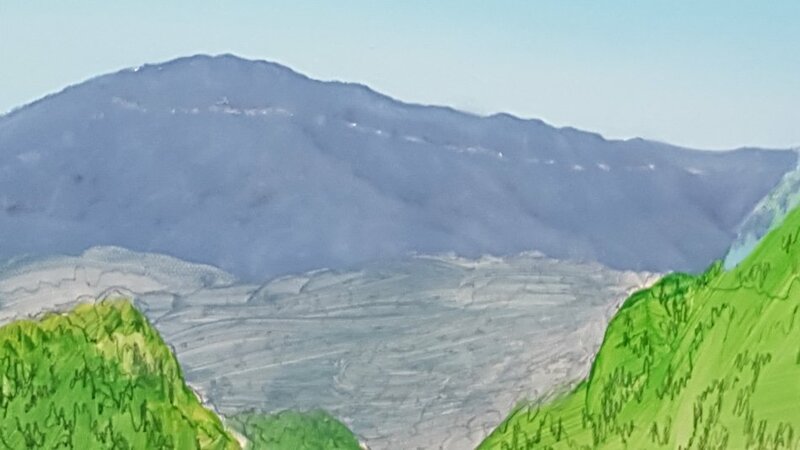 Close up of distant mountain range landscape painting. How to paint mountains, the middle ground begins. In this next picture, I begin the middle ground mountains. These are a little more intense in color and the value range is beginning to broaden. Again, individual trees cannot be seen, but the overall shape of the canopies are beginning to be realized. The most important thing here is to get the values correct. Those blue grays, can't be to dark, or too light. Each mountain feature that moves closer to the viewer will have darker darks, and lighter lights. And a bit more color intensity. In this photo, you can see on the left, some hills behind the foreground trees, and on the right, a large section of forest that has first, the darks laid in, then the greens over top. These are done with a #4 filbert and #4 liner. 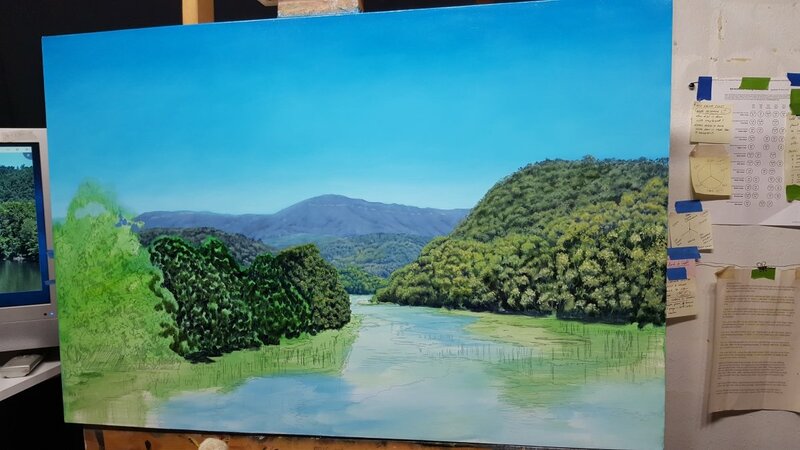 As we continue to move forward into the foreground, more trees on the left. Darks put down first. The trees on the right are developed a bit more with some details using a #1 liner to add canopy tops. Here, the left foreground trees are being developed more with greens put over top the darks. Using mostly a #1 liner. Varying shades of green are also used. 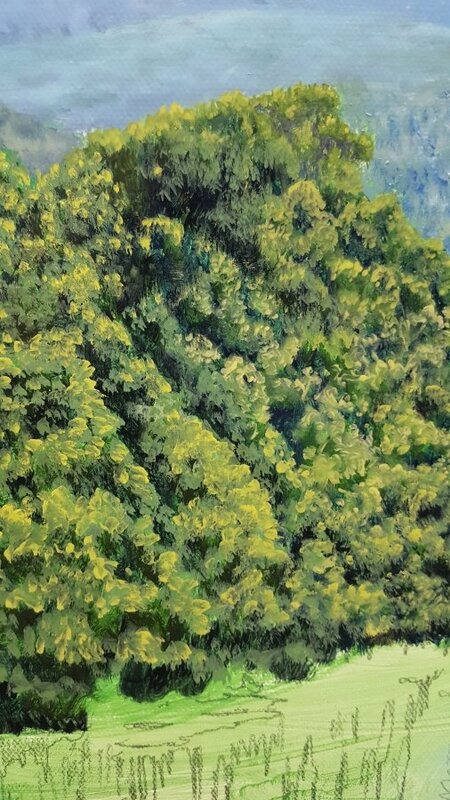 In this closeup of the foreground trees on the left, at least 5 different shades of green are used to develop the tree tops. It looks very abstract up close, but at viewing range of 3 to 6 feet, the realism is incredible. In this closeup of the trees left, our biggest and closest tree is being started with darks being put in. A #4 old beat up filbert was used. 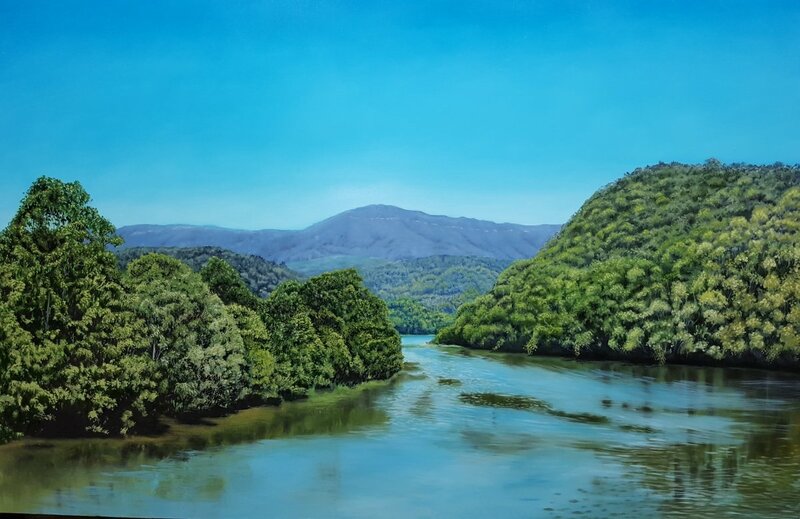 Here, the closest foreground tree is being brought along with more greens, and the right side river bank is having the reflection started. I've also begun adding color to the water. 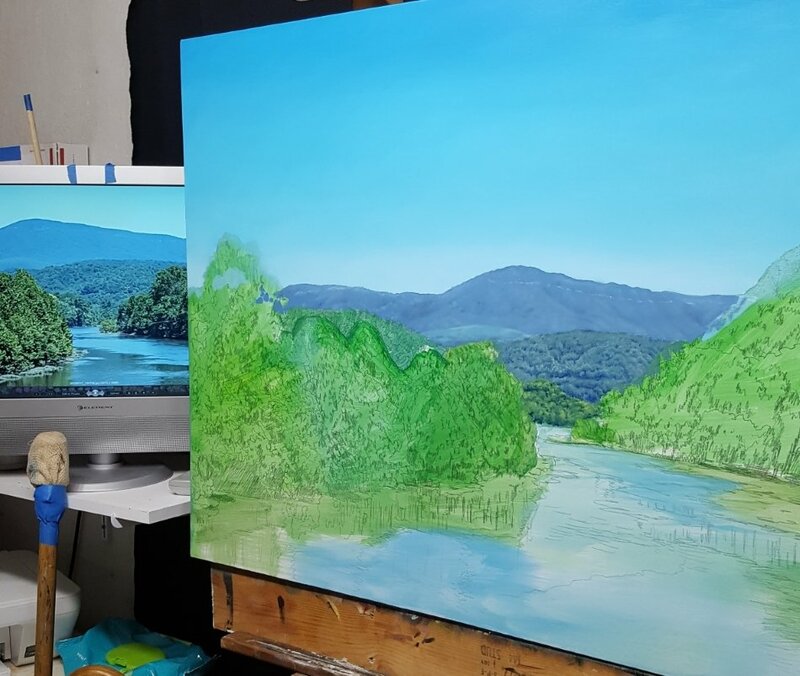 How to paint a river, oil painting in progress. 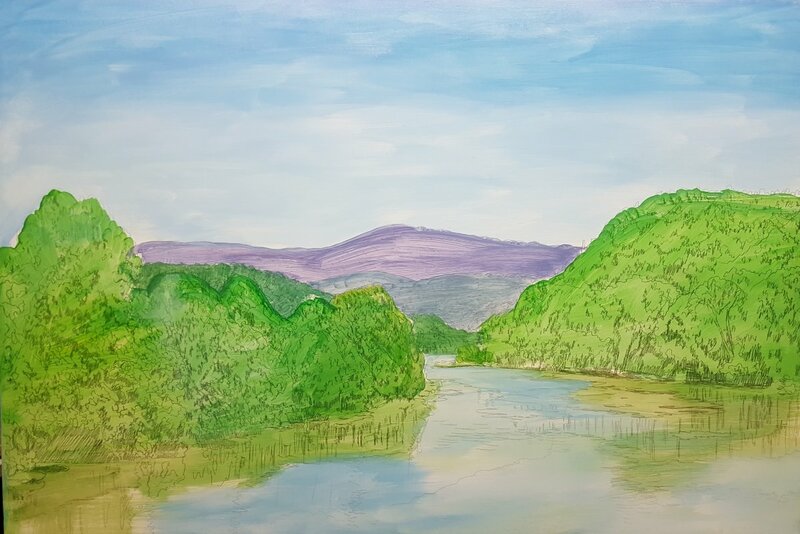 Heres, all the trees have been fully developed, river water with reflections are about done, and I am beginning to think on do I need any improvements. I particularly like the shallow bottom depiction on the left bank. 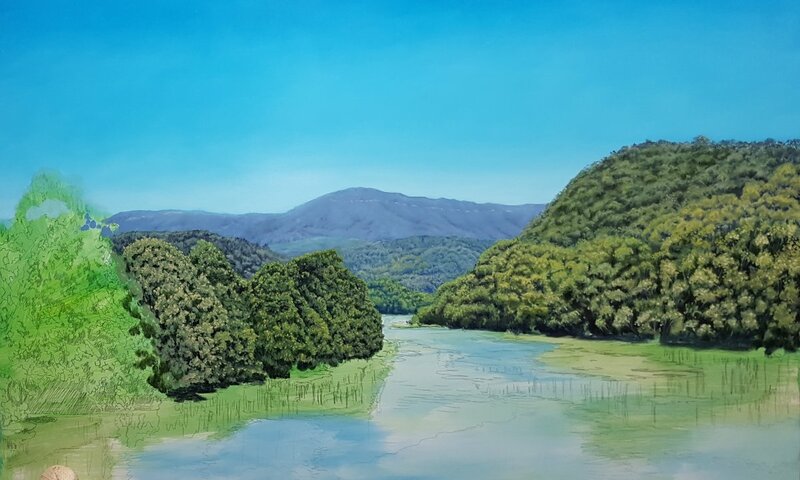 Having fished similar waters, this area of the river bank, though not true to the reference photo, is giving a mysterious view of a shallow river bank. 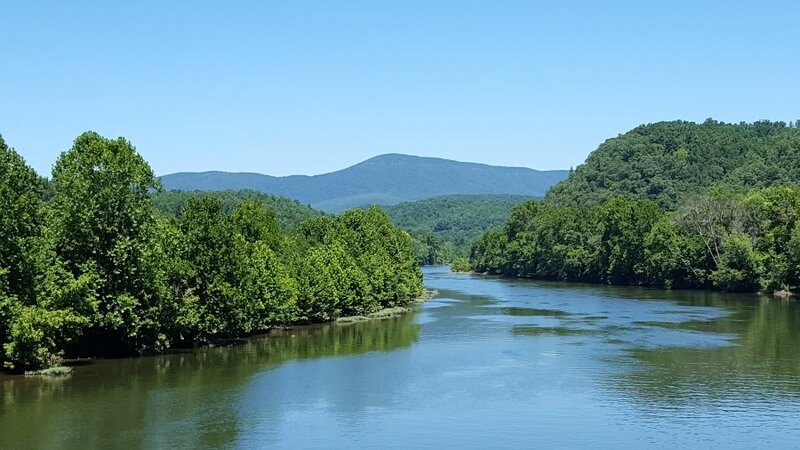 One in which, if you are fishing, you take a quick swim or just let your feet hang off the boat, because it's shallow, you can see snakes and snapping turtles, and it is relatively calm cooling water. 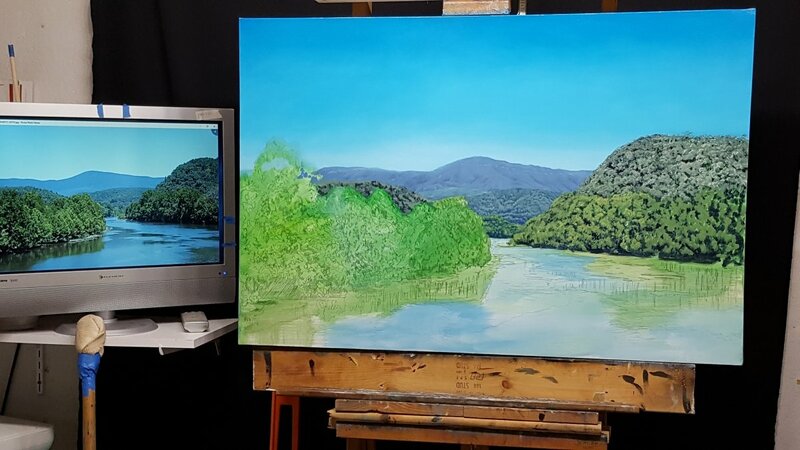 How to paint mountains and a river, oil painting in progress. With final highlights around the center of the river reflecting the swifter moving water, and a signature, this one is ready for the Gallery. 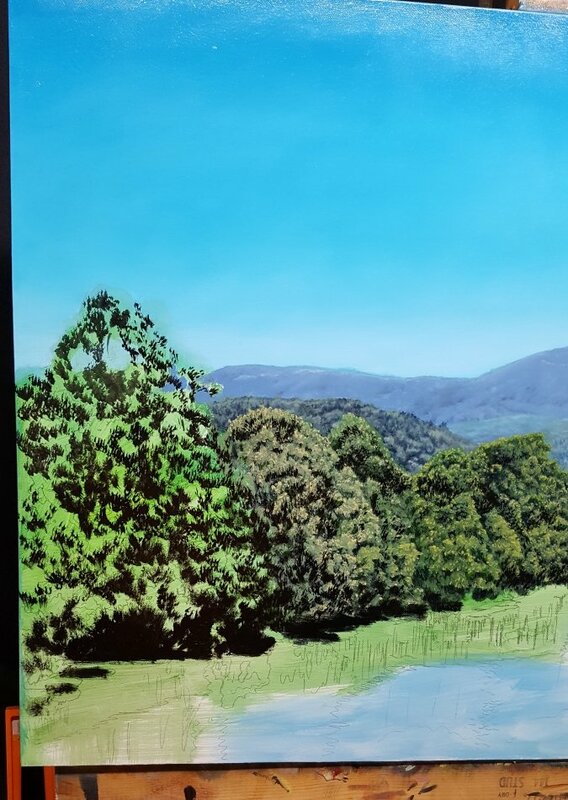 I've added a few dead trees to the right bank, and evened up the green tones throughout the piece. I'm still amazed at the transition within the blue sky. Harry Flood Byrd Memorial Bridge north on the Blue Ridge Parkway, James River. Mabry Mill, which is also located here in Virginia. 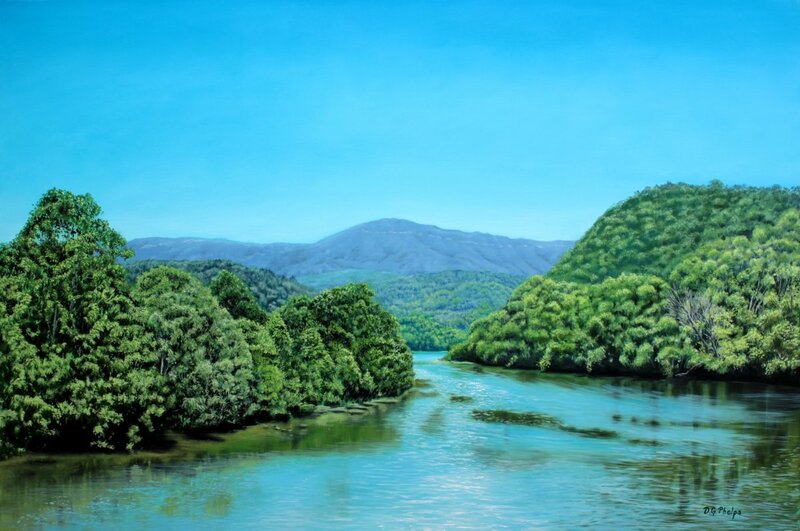 Click Me to get the full eBook on how to paint landscapes! This eBook covers most of what is discussed above, and also includes a great deal about composition. How to paint mountains using a great shortcut. How to paint mountains, rivers.